There comes the time in our journey towards our great goals when we understand, that maybe our powerful tools (e.g. shungite) are not enough, or maybe that we need to boost this journey up. That is when our determination and our mental state come in. We can set our goals and feel pretty confident in our strength and ambitions, yet our subconscious might just think otherwise. And that’s not our fault; that is just the nature of subconscious. As Friedrich Nietzsche once wrote, our “It” hates our “I”, so there is a constant conflict between us and our subconscious. You may have moved on and decided to set goals in your live you want to achieve, but the negative past experience or emotional traumas still may haunt you, even your mind seems to be set straight. Today we are going to tell you how you can overcome different blocks your subconscious may impose on you and clear the way towards your objectives with the help of shungite. On itself, shungite is a very powerful mineral with a number of healing and balancing properties that has already proved popular among our clients and it helps them in different ways every day. But, as we said before, sometimes there are some obstacles in the way, imbedded in our subconscious. To break these blocks we should be assured in our intentions and confident in our goals. That is where the power of the word and self-confidence comes in in a form of affirmation. Affirmation is basically a small sentence that has influence on our conscious and subconscious. It brings images and sends signals to our mind that we want to reflect in our behavior and mood. Affirmation’s goal is to surface the ambitions and intentions rooted in our nature. It inspires and motivates us and is able to revitalize our energy, especially if this energy is lost. And it works best when combined with such powerful spiritual items as minerals and stones. Each stone has different intention behind it and different affirmation as well. This way, you should start with defining your intentions and picking your mineral accordingly. Shungite is the best choice if your intentions are Health, Balance and Protection. Shungite proved over the years to be of a great help in healing, during restoration and rest. It also has a stimulating effect on the Root Chakra, which in turn balances the whole system of Chakras and has a positive effect on the stabilizing the energy of your body, both physical and spiritual. More than that, Shungite is known for its protective properties, as it shields its user from a number of negative effects and influences in our environment, most notably the EMF. So as you can see, shungite is a perfect choice for these intentions. So once you have established that shungite is suitable for your intentions, the next step would be to search for an affirmation. Of course, affirmation is something personal and it depends on your own goals and intentions. However, we will give you several examples so you can start enjoying the power of shungite easily. But remember, you can always go creative and make your affirmation suit your objectives. If you are going for protective properties of shungite to secure your household and your close ones, you can repeat “I am safe, grounded and secure”. Another variation of that, which is narrower, goes like this: “I am shielded from negative energies”. If you mostly depend on shungite in your healing process, the affirmation is very simple: “I'm able to heal. I'm the healer”. Another one can be “My body heals at a cellular level”. For more comprehensive enjoyment of the powers of shungite, you can repeat “I am healthy, strong and powerful”. For Chakra balancing the affirmation can be “I open myself to absolute purification, and to the entry of the Light into every atom of my being”. It is really up to you, what affirmation you will use during your meditations or crystal healing. You can change them or make up your own according to your desires and combine them from time to tie, if you are looking for different effects. 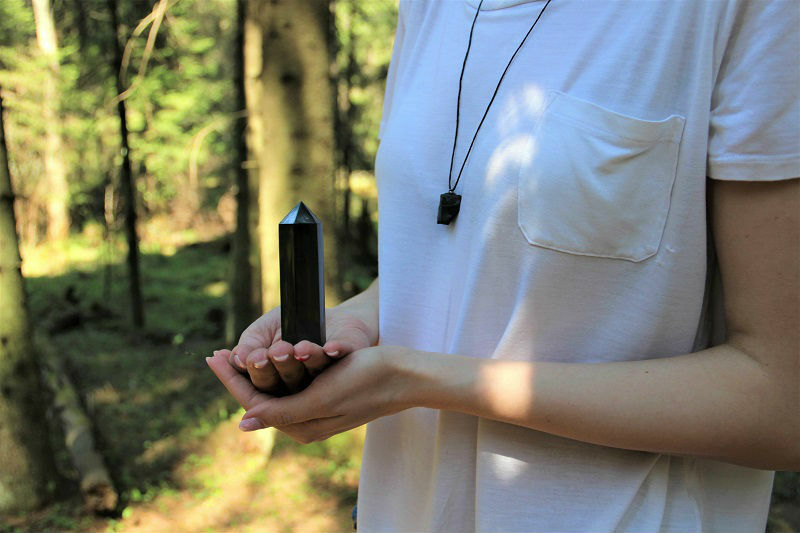 The process is of your own making and shungite is your personal assistant in it. Repeat these powerful affirmations and move towards brighter future with shungite in your hand!